L’évolution forestière dans les massifs alpins et jurassiens : conséquence directe sur l'état physico-chimique des niveaux profonds des lacs ? The issue of acidification in lake waters has been the topic of numerous scientific studies in northern Europe and North America. In recent years, interest in the topic has spread to southern Europe and Asia because similar symptoms have been observed (drop in pH and in redox potential, generally accompanied by oxygen depletion). All the scientific work on the issue has concluded that the phenomenon is general and affects, to different degrees, lakes located at low to medium altitudes in mountains (the Vosges mountains and more recently the Jura mountains, in France). The difference in degree is often interpreted as the result of different combinations from three sources, namely acid rain, direct discharges of pollutants and the spread of forests (essentially conifer species). The first two sources have been confirmed, but the third is less perceptible due to slow progression of the phenomenon. Analysis and modelling of changes in land cover in the Hérisson river basin in the Jura mountains (largely carbonated soils) confirmed the direct impact of the forest cover on the physico-chemical quality of lake waters, in particular at the deeper levels (hypolimnion) over the past 30 years. The impact is reinforced by the considerable presence of peat zones around the lakes which, during high-water periods, contribute large quantities of dissolved, particulate organic matter. The goal of this work is to show the direct impact of the increasing forest cover observed on the Jurassic plateaus, caused by a considerable reduction in farming activity over the past 30 years. This work focuses on an analysis of land cover (vegetation), using four satellite images spanning the period from 1975 to 2006, and calls on hydrogeochemical modelling (WARMF) to evaluate changes in the physico-chemical quality, i.e. acidification, of deep lake waters. This first step is followed by a predictive phase prior to measuring the intensity of the physico-chemical changes (pH and redox) over the next 20 years to 2030. The existence of this phenomenon confirms the massive releases of heavy metals recently noted and the biological weakening observed in certain lakes, notably among the benthic fauna. 1Changes in land cover in the Alps and Jura massifs over the past 30 years have become a recurrent issue and the topic of significant scientific research to measure the impact of climate change on certain species in certain areas (notably in the Vercors, Lautaret pass and High Jura regions), as well as modifications in the forests and landscapes in these areas. Processing and analysis of aerial photographs and satellite images have confirmed the changes and revealed a progressive “closing” (forestation) of landscapes, particularly in medium-altitude mountain regions, and urban sprawl in low-lying regions. The phenomenon has been reinforced by two main factors, namely the significant drop in available urban real-estate, which has produced a clear extension of smaller towns and built-up areas, and the massive emigration of farmers, which has reduced farmland in favour of forests made up essentially of conifers. 2This development is worrisome for managers, particularly managers of water resources, who see the available reserves progressively drop due to increasing evapotranspiration and measurable disturbances to hydrological resources throughout entire river basins. This closing of landscapes also weighs on rivers and lakes, which have registered significant rises in organic matter in their waters, generally accompanied by large drops in dissolved oxygen, potential redox and, above all, the pH. Acidification of aquatic environments is generally on the rise and the research carried out on the subject initially attempted to understand the causes and to evaluate the effects on ecosystems (Smol, 2008, Ek A, et al, 2001; Battarbée, … Chen-tung a. et al., 2004). On the whole, three factors lie at the origin of the acidification processes, 1) acid rain, 2) industrial (N, S) and household discharges, and 3) growing forests with the development of acidophilic tree species (essentially conifers). Other factors concern the presence and extension of wetlands in the catchment zones of lakes and around lakes. 3Use of new information technologies, in particular geographical information systems (GIS) and remote sensing, has vastly improved our understanding of ecological processes and the organisation of landscapes. However, there have been few attempts to model these systems by combining hydrogeochemical models and GISs, in view of predicting and above all evaluating the consequences of such changes. We propose here an innovative approach in an attempt to model changes in the forest cover over the next 20 years, based on a careful combination of remote sensing and geomatics in a first step, followed by coupling with a hydrogeochemical model. The method involves processing four Landsat images and modelling changes in land cover using the Idrisi Land Cover Modelling (LCM) module, then integrating the results of this first step in the Watershed Assessment Risk Management Framework (WARMF) model. The goal is thus to understand the general operation of lakes and to predict future changes in their physico-chemical status. The geographic area addressed by this study is the lakes region (mid-altitude plateau) of the Jura mountains. 4This study took place in three steps (figure 1). 5A total of four Landsat images dating from 1975, 1992, 2000 and 2006 were used. Channels 2, 3 and 4 were combined. Experimental studies on defining groups of plant species have demonstrated the clear superiority of the TM 2,3,4 combination. Supervised classification, based on the Maximum Likelihood method (N.Boulahouat et B.Naert, 1996; Aykut Akgun et al, 2000), was used to detect the various types of land cover. The 2006 image was processed first to check the results with the actual terrain. It served as the reference point in processing the older images, using data extracted from the invariant image. The 2006 image was also used to select the samples used to process the other images, using the same method and consequently the same algorithm. The ENVI 4.5 software was used. 6The results of the remote-sensing processing were fed into the GIS (Idrisi) database. Model calibration took place in four steps. The digital terrain model (DTM) was extracted from the SRTM 30 files, then corrected (filling in holes using the esrihydrological module) and transformed to cover the lakes region in a Lambert II Carto projection. The DTM could be integrated in the LCM module as a constraint to determine the impact of the slope on changes in land cover, then to estimate the flow rates at various lake outlets using the WARMF model. The slope and other physiographic factors are basic parameters in the WARMF model. The road network was digitised using ArcGIS and then transformed to image format to remain consistent with the other mapping data. The results of the remote-sensing processing were converted to image format. The images (30-metre resolution) were georeferenced and adapted to cover the same sector as the mapping data above (DTM and roads). A series of distance maps were created for the roads and rivers, considered as variables by the LCM module, based on the principle of a probabilistic calculation using the Markov method, which consists of evaluating the probability of one type of land cover replacing another. Several steps are needed to create the predictive maps using the LCM module, which requires land-cover images (land-cover data in image format) from two periods as input parameters. For this study, we used the images from 1975 and 1992, the image of the road network and the DTM. The model constructed the transformation matrix using the above images with, as needed, corrective action using the calibration results. Checks were run based on the 2000 image as the reference. The second step consisted of selecting a suitable method for the potential transition from among the following five, Evidence likelihood, Exponential, Square root, Natural logarithm and Logit. A quick test on the potential power of the explicative variables was run at each calibration step to validate the model. This is a means to, among other things, adjust additional data concerning the map showing the spatial trend of change, the data on the hydrographic network, the position of towns, etc. Once the model is calibrated, a predictive calculation is run using the previously selected date. 7In view of modelling the changes in land cover over the next 20 years, the LCM module served to draft predictive maps based on a number of parameters and decision rules. The parameters may be constraints or factors to limit or enable changes and consequently changes in the land cover. For example, a first-order constraint that was taken into account during processing forbid replacing rivers and lakes with built-up areas. 8Model calibration took place in two steps. The first step used the 1975 and 1992 satellite images to produce the predictive map for 2000. The map was compared to the processing results of the 2000 image to assess deviations and the validity of model calibration. Deviation values were in the 15% range. A second analysis of land cover in the Hérisson river basin, similar to the first, was run using the 1992 and 2000 images. Changes during this period were generally similar to the first, with however a slight drop in farm and open land. Calculated deviations between the 2006 predictive map and the land-cover map produced by the 2006 remote-sensing data were somewhat less than 15%. We considered these results acceptable even though they should be a bit more precise. 9The results of this first modelling phase were fed into the WARMF hydrogeochemical model for lakes and rivers. Developed by the U.S. company Systech, WARMF is a logistic model designed to assist in decision-making and management of water resources in large river basins (Chen et al., 2010). Equipped with a large chemistry database, it can evaluate physico-chemical trends in a lake or river in daily time steps. A number of parameters concerning hydrometeorology (P, T, humidity, flow rates, etc. ), air and water chemistry (N, S, majors, traces, etc. ), sediment (organic matter, majors, traces, etc.) and the river basin (S, P, slope, land cover, soil type, hydrodynamic characteristics, etc.) are required to calibrate the model and for its operation. 10The study area is in the Jura department, halfway between Saint-Laurent-en-Grandveaux to the east and Clairvaux-les-Lacs to the west. The Hérisson river basin covers approximately 50 square kilometres on the low and mid plateaus and comprises the towns of Frasnois in the east, Songesson in the west and Bonlieu in the south. It is bounded on the west by the town of Doucier. In total, there are six lakes, four on the mid plateau (Petit and Grand Maclu, Illay, Bonlieu) and two below (Val and Chambly) (figure 2). 11Economically speaking, farming (essentially livestock farming) is the main activity. Throughout the basin, meadows dominate near the lakes, with forests on steep slopes and in the higher regions. 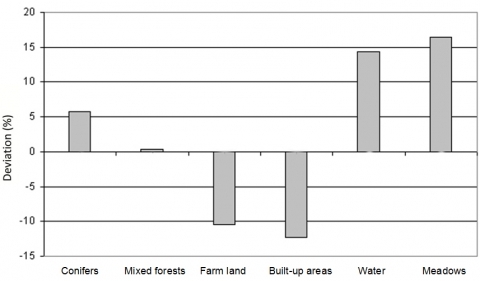 13Comparative analysis of the results mentioned above revealed two fundamental aspects concerning changes in land cover in the Hérisson river basin (figure 3). First, a clear drop in farm land from 1975 to 1992. This was confirmed by field surveys in the town of Frasnois in April 2011. This drop probably stopped and entered a stable phase at the beginning of the 1990s, which was highly visible when comparing the 1992 and 2000 images. This was confirmed over the 2000 to 2006 period, which clearly revealed a rapid shift prior to 2000 and a slowing after 2000. 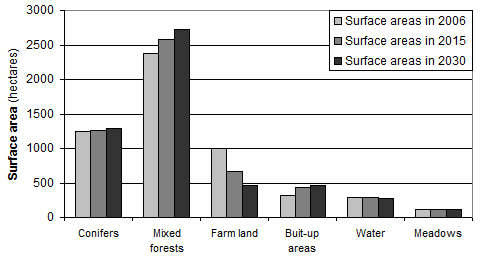 Secondly, three types of land cover were affected by the decrease in farm land. The most affected were mixed forests, which tended to expand in the northern and western sections of the river basin, then conifers which increased in the upper regions and, finally, built-up land. The latter practically doubled in 40 years around existing villages, particularly in the lower section of the basin near Doucier. —This trend continued and significantly accelerated in 2000, clearly revealing the predominance of areas with mixed forests. Expansion of conifers was much less significant and always in the southern section, in the Bonlieu catchment. —Built-up areas underwent major change in the lower section of the Hérisson river basin, near Doucier. They almost doubled between 1975 and 2006. —On the whole, meadows decreased fairly significantly and provided a relatively precise indication on the closing of landscapes affecting the river basin and the Jura massif in general. This reduction resulted in an expansion of mixed forests (hardwood, pines, etc.) or of built-up areas, as evidenced in numerous villages where the percentage of recent buildings has increased sharply. 14Generally, as noted in the figure above, the greatest losses were suffered by farm land and open areas, often used by farmers. These losses amounted to 8% for the first category and 5% for the second. The main beneficiaries were mixed forests and conifers, particularly in the upper section of the river basin, as shown in figure 4 (see the circles), with built-up areas also benefitting locally. 15The changes are very clear in three parts of the river basin. First, in the lakes region on the mid plateau, more precisely in the catchment of the Ilay lake where there has been a clear increase in recent construction. The same phenomena was noted in the lower section, not far from the outlet of the Hérisson basin near Doucier, and in the town of Songesson, which owns the Val lake. 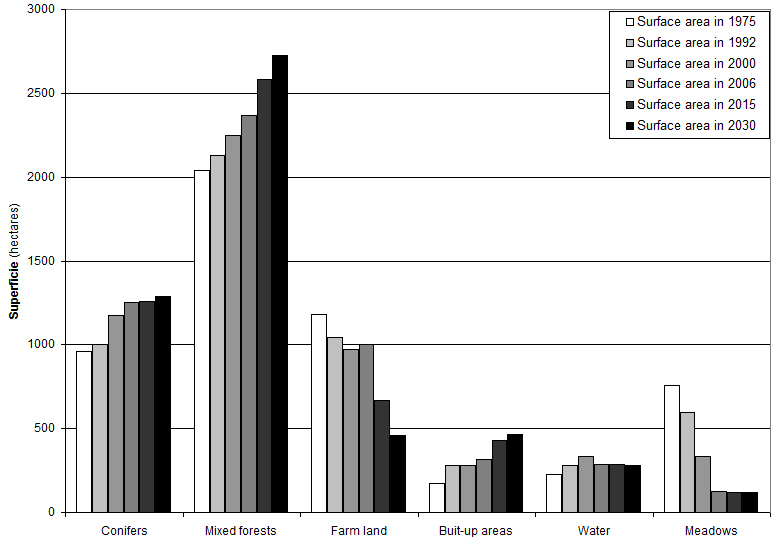 16Conversely, there was a sharp reduction in open spaces in the same sectors, with an increase in mixed forests. 17The downstream sector also stood out with a reduction in urban areas, which were dominant at the end of the 1970s, but highly fragmented by 2006 in comparison. This trend confirmed the massive emigration to the towns of Clairvaux and Champagnole, which have become true urban centres for the past 20 years, and the replacement of these areas with mixed forests. 18To the south, near Bonlieu, conifers remain dominant, but a few stands of mixed forest (conifer and hardwood) have appeared to the south-west of the lake. This expansion of conifers continues along the Hérisson river, progressively taking over land from the mixed forests around Songesson. 19On the whole, there is a fairly remarkable contrast between a downstream section with dense built-up areas and open spaces that remain open, and an upstream section where forests have expanded (conifers in the south and mixed forests to the north). 20The recurrent question raised by managers concerns the future of these areas over the next 20 years and primarily the plant species that will grow there, in view of measuring the influence of the latter on the quality of the aquatic environments (the lakes). The lakes are very sensitive to organic inputs that significantly affect their physico-chemical parameters and alter the chemical quality of the water (release of metals, organometallic compounds, etc.). The LCM modules (CLARK, 2010; Gilmore, 2006) made it possible to calculate the probabilities of change in land cover and to draft a predictive map for the next 20 years. The selected change function is a decreasing sigmoid function, given that the drop was rapid during the 1975-2000 interval and slowed considerably starting in 2006. 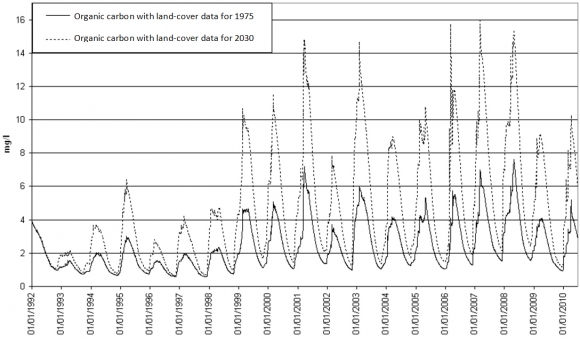 21The model was first calibrated by taking into account the land-cover maps for 1975-1992 and 1992-2000. The results of each step were used to create the predictive maps corresponding to the date of a map created using the remote-sensing data. 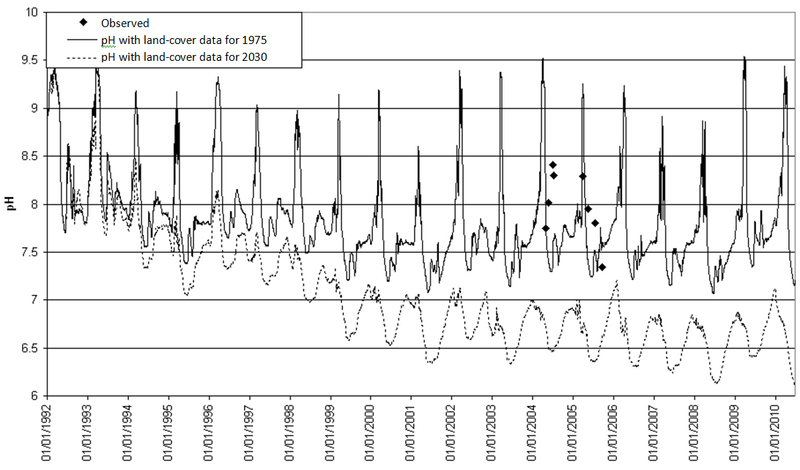 For example, the 1975-1992 period resulted in the predictive map pour 2000, which was then compared to the 2000 map created using the remote-sensing data. The same procedure was used for the 1992-2000 period and the predictive map for 2006, which was compared to the 2006 remote-sensing map. The deviations (figure 5) indicate that model calibration was satisfactory given error values of 2 to 15%, which is an acceptable level. 22The simulations made it possible to create predictive maps for 2015 and 2030. Analysis of the results produced a number of observations concerning future changes in land cover in the Hérisson river basin (figure 6). The maps predict densification of urban areas in the downstream section of the river basin, around the village of Doucier. This was foreseeable given the proximity of Champagnole, which encourages this type of change. This expansion will also take place at higher altitudes, namely on the Ménétrux plateau, which currently stands out for its very agricultural character (mainly corn). The same phenomenon will tend to occur, but to a lesser degree, in the upper section, in the villages of Frasnois and Bonlieu. In the latter village, it is the town of Clairvaux that will exert an influence. 23For forests, a trend contrary to the current trend emerges in the maps, with a sharp reduction in conifer forests in the catchment of the Bonlieu lake. This process is evident in 2015 and accelerates in 2030. Almost two-thirds of the land will be occupied by mixed forests. This trend weakens as one progresses up the Hérisson river, where conifers will tend to develop significantly on the slopes and on the upper part of the Songeson plateau. 24Farther to the north, conifers will also develop in the area around the Ilay lake, particularly to the west where the Jurassic limestone cliffs emerge (figures 6a and 6b). 25The comparison of the simulated cover with the data drawn from the 2006 satellite images is the means to measure the changes and to more precisely determine the sectors affected by the changes. 26On the whole, two types of cover will follow the existing trend, i.e. a slow but real increase, namely mixed forests and built-up areas (figure 7). 27Conversely, conifers, meadows and water areas show no change and their surface areas will remain virtually constant. 28Mixed forests will cover a total of almost 2 500 hectares throughout the basin, followed by conifers with 1 200 hectares. Farm land and built-up areas follow inverse trends. Farm land will tend to decrease whereas built-up land will increase. 29These changes in land area and land cover, particularly when the plant species are conifer and hardwood trees, are not without consequences for lake waters, notably the deeper levels. Recent chemical (Martin, 1990; Nedjai et al., 2010; DIREN, 1999, 2004) and biological studies on the various lakes have shown a drop in fauna and particularly benthic fauna (Verneaux et al., 2004). In parallel, significant increases in organic matter have been observed in the first ten centimetres of sediment, confirming an increase in organic flows essentially from the wooded slopes and wetlands around the lakes (Nedjai, 2010). Tests to determine the percentage of organic matter in the sediment by heating to 550°C for six hours showed results of approximately 40% of the total sample weight, whereas it was only about 20% at the end of the 1800s or beginning of the 1900s. To characterise this increase, we modelled the flows of organic carbon, oxygen and pH over the 1992-2010 period using the land-cover data from 1975 and 2030 and based on current hydrometeorological conditions. This approach was decided upon because the goal is to determine the impact of land-cover changes without taking into account climate change. It is nonetheless certain that the latter is strongly linked to the plant and physico-chemical dynamics involved here. 30Input of pedological data (hydrodynamic characteristics: hydraulic conductivity, land cover), hydrometeorological data (Frasnois weather station, flow rates at the Hérisson station), hydrochemical data (authors' data, 2010; DIREN 1999, 2004, 2005; Verneaux J., 1984) and geochemical data drawn from measurements by DREAL (formerly DIREN) and our own analyses made it possible to simulate the lakes and rivers of the river basin. Simulations were run with a time step of one day over the entire period under study. Calibration was based on the hydrological results (flow rates measured at the Hérisson station) and model variables were adjusted for the 2000-2010 period. For that period, we have fairly complete and continuous hydrometeorological series as well as several series of chemical analyses of lake water and sediment. The simulations addressed two levels, the surface and the base of the hypolimnion to measure the intensity of disturbances in physico-chemical parameters and to determine the flows of organic matter from the catchments. The simulations were run for the years 1975 and 2030 to observe the potential drift in the physico-chemical parameters and to measure deviations caused by changes in land cover over the period. In this case, we took 1975 as the reference year, though fully aware that the disturbance, i.e. acidification, is older, as shown by the geochemical analyses that we ran on sediment in the various lakes. The reduction in cationic flows, essentially calcium, confirmed this trend and the retention of these elements by the organic deposits on the forest floor (soil litter). 31On the whole, in terms of organic input, we observed an increase in flows of organic carbon from 1992 to 2010 (figure 8). The closing of the landscape and expansion of forests, essentially mixed forests, resulted in relatively high organic production. The organic production may be estimated at approximately 70% of the total, with spikes reaching almost 100% during years with heavy rainfall. 32This increase in organic inputs disturbed the main physico-chemical parameters, particularly the pH, which dropped over the same period. 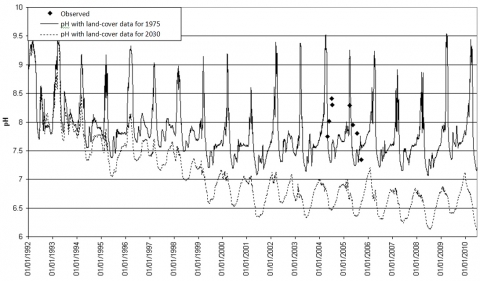 As shown in figure 9, the measurements carried out in 2004 and 2005 confirmed the drop. 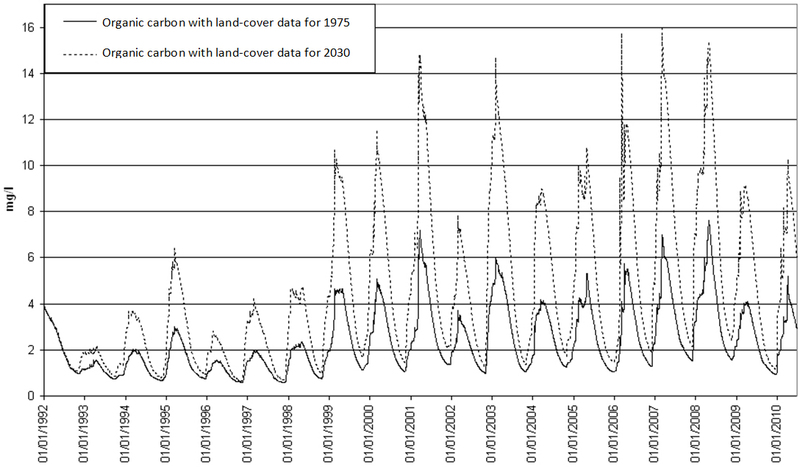 33Modelling of this parameter and inclusion of the 1975 and 2030 land-cover data confirmed the trend. The state of the 1975 land cover was relatively stable, characteristic of carbonated environments, with pH values between 7.5 and 8. With the exception of a relatively slight drop at the beginning of the period, pH variations were relatively stable outside of snow-melt periods, characterised by leaching of impaired soil with, as a result, high carbonated inputs. 34Input of the 2030 land-cover data, however, showed significant acidification and a drop of 2 pH to a level under the 6.5 threshold. Attenuation of spikes in pH was also observable, attributable to a reduction in carbonated inputs due to a thickening of the soil litter and/or of the organic layer under the lakes, thus reducing the buffer effect of the carbonated deposits. 35The results of the direct measurements and of the hydrogeochemical modelling clearly reveal that changes in land cover have a direct impact on water quality, particularly at the deepest levels which enter a phase of asphyxia. Lakes are generally characterised by very slow circulation of their waters, which results in strong chemical exchanges with the lake bed. The example of the Jura mountains and the Hérisson river basin generally confirms this situation caused by the closing of the landscape. Closing is the direct result of reduced farming and expansion of forests, mainly conifers and mixed forests, into the formerly open areas. This growth in turn results in increased organic production and soil litter. The litter forms a barrier for surface runoff and considerably reduces cationic exchanges, mainly with the limestone formations in the river basin. The solid inputs, primarily organic in nature, form a barrier layer and limit exchanges between the deep water and the rock, and thus the buffer effect of the carbonated deposits. The pH values have dropped considerably over the past 30 years, signalling significant acidification of the lakes. In parallel, an equivalent drop in the redox potential was observed, which may result in the release (dissolution) of heavy metals (mercury, zinc, chrome, etc.) (Charlet et al., 2003). The relatively high levels of aluminium observed in deep waters (hypolimnion) are a clear indication of this situation. Simultaneously, a drop in quality was revealed by a drop in the abundance of fauna, primarily benthic fauna which was confirmed by Verneaux (2004), and by the reduction in noble species (European whitefish). Agence de l’Eau Rhône Méditerranée et Corse, 2004. – Les lacs du Frasnois : Ilay, Narlay, Petit et Grand Maclu. Synthèse de données. Rapport interne. Agence de l’Eau Rhône Méditerranée et Corse, 2008. – Etude paléolimnologique sur 8 lacs du district Rhône-Méditerranée. Mise en place d’éléments de référence pour les lacs des 9 Couleurs, d’Anterne, de Chalain, de Lauvitel, Nègre, de Rémoray, du Vallon et de Vens 1èr. Rapport interne. Akgun A., A. Husnu Eronat A. and Turk N., 2000. – Comparing different satellite image classification methods: An application in Ayvalik District, Western Turkey, p 24. Barbieri A. and Mosello R., 2000. – Recent trends in chemistry and mass budget of a high altitude lake in the southern Alps (Laghetto Inferiore, Canton Ticino, Switzerland), J. Limnol, 59 (2), pp. 103-112. Battarbee R.W, Mason J., Renberg I., And Tailing J.F., 1990. – Paleolimnology and lake acidification. London, The Royal Society. Boulahouat N. et Naert B., 1996. – « Télédétection des ressources en sols des zones arides ». Etude et Gestion des sols, pp. 11-14. Charlet, L., Roman-Ross G., Spadini L. and Rumbach G., 2003. 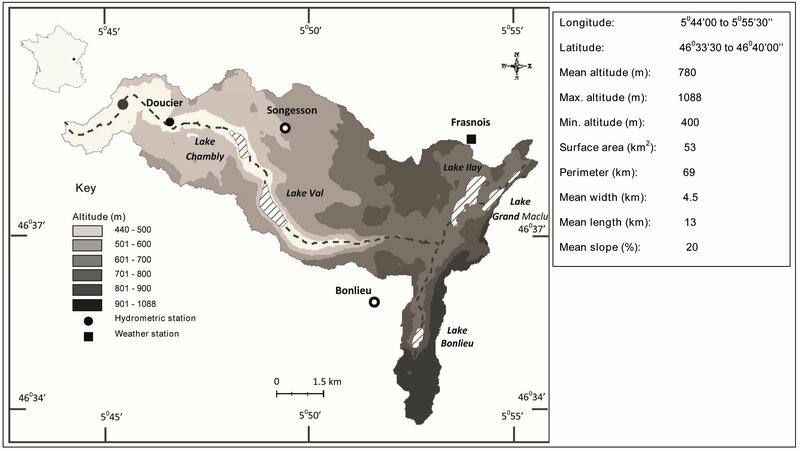 – « Solid and aqueous mercury in remote river sediments (Litany River, French Guyana, South America) », J. Phys. IV France 107. Chen-Tung A. Chen, Wu J.-T., Wang B.-J., Huang K.-M., 2004. – « Acidification and Trace Metals of Lakes in Taiwan ». Aquatic Geochimestry 10: 33-57. Chen C. W. and Herr J. W., 2010. – Simulating the Effect of Sulfate Addition on Methylmercury Output from a Wetland, p 12. Clark Labs., 2010. 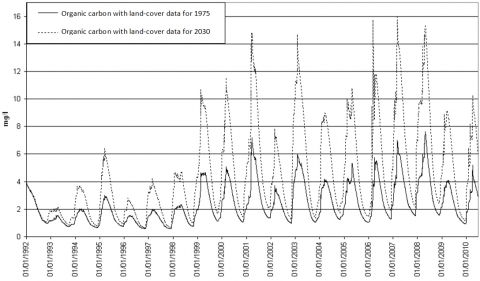 – Modeling REDD Baselines using IDRISI’s Land Change Modeler, p. 2. Diren de Franche-Comté, 1999. – Les lacs du département du jura et leur bassin versant. Synthèse des données et propositions de gestion. Rapport interne. Diren de Franche-Comté, 2004. – Les lacs du Frasnois Ilay, Narlay et Grand Maclu. Synthèse des données. Diren de Franche-Comté, 2005. – Zones humides, falaises et pelouses du lac de Chalain, Znieff n°04840007. Ek Anna S., Renberg I., 2001. – « Heavy metal pollution and lake acidity changes by one thousand years of copper mining at Falun, central Sweeden ». Journal of Paleolimnology, 26: 89-107. Gilmore Pontius Jr R. and Hao C., 2006. – Land Change Modeling with GEOMOD. Martin C., 1990. – Lacs de Franche-Comté (massif du Jura), Recherches sur le seston, plus particulièrement sur le trypton organique. Thèse de doctorat. Université de Franche-Comté. Nedjai R., 2010. – Les lacs dans leur bassin versant : de l’évaluation à la gestion environnementale. Habilitation à diriger les recherches en géographie. Université Joseph Fourier. Nedjai R., Messaoud-Nacer N., Lanson M., 2010. – « A history of lead pollution in nine lakes in the Franche-Comté region, eastern France, throught the analysis of lakebed sediment ». Internation Journal of water Resources and Environment management. Volume 1, Number 1, January-June 2009, pp. 103-116. Nguyen D. D., 2000. – Land cover category definition by image invariants for automated classification. International Archives of Photogrammetry and Remote Sensing. Amsterdam, pp. 986-990. Smol J.P., 2008. – Pollution of lakes and rivers. A paleoenvironmental perspective, Second edition. Verneaux V., Verneaux J., Schmitt, Lovy C., Lambert J.C., 2004. – « The lake biotic index (LBI) : an applied method for assessing the biological quality of lakes using macrobenthos ; the Lake Chalain (French Jura) as an example ». J. Lim. 2004, n°40. Verneaux J., 1984. – Monographie des lacs du Jura : Lac de l’Abbaye.